Here’s an interesting piece on the danger of believing everything you see on Twitter. The author does a nice job of explaining how traders got caught with their pants down because no one bothered to verify the source of the original rumor. This entry was posted in Oil industry and tagged oil, rumor, The Social Graf, traders, Twitter on August 7, 2012 by Roger Harris. In my column in Sunday’s News Sentinel, I supported elimination of the $4 billion in annual tax subsidies enjoyed by the oil industry. It would be a good start toward solving the financial crisis facing the federal government. My suggestion prompted a call from a spetical reader who wanted to know specifically what tax breaks the oil industry enjoys that aren’t available to other industries. It’s a good question and I appreciate the call. I was referring to tax breaks of various kinds, some are specific to the oil business and some are also available to other kinds of companies. This entry was posted in Oil industry and tagged financial crisis, Obama, oil industry, oil industry tax breaks, tac credits, tax subsidies on August 16, 2011 by Roger Harris. deserves taxpayer subsidies when it reports a quarterly profit of nearly $11 billion. 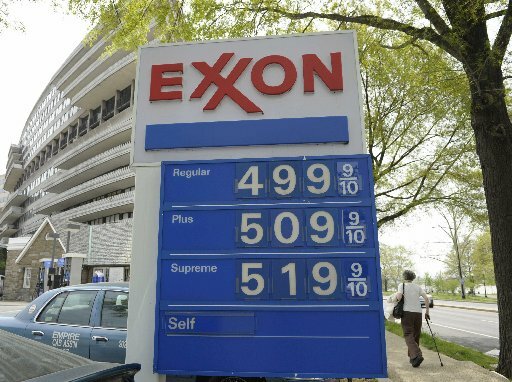 But that’s what we saw on Thursday when Exxon Mobil Corp. released its first quarter report. The giant oil company said it earned $10.7 billion, its largest quarterly profit since the 2008 third quarter when gasoline prices were even higher than they are now. Along with the financial report, Ken Cohen, Exxon’s vice president for public affairs, published a lengthy statement on the company’s Perspectives blog defending Exxon’s soaring profits and blasting politicians for daring to protect taxpayers’ interests. This entry was posted in Oil industry and tagged Big Oil, Democrats, Exxon Mobile, Mike Cohen, oil, oil industry, President Barack Obama, taxpayer subsidies on April 29, 2011 by Roger Harris. It’s Miller time on Wall Street! Tennessee oilman Scott Boruff, CEO of Miller Energy Resources, celebrated the company’s move to the New York Stock Exchange today by ringing the market’s opening bell. Boruff was joined by founder and chairman Deloy Miller and other Miller Energy officials and family members. Huntsville, Tenn.-based Miller Energy, which previously was traded on Nasdaq, began trading on NYSE on Tuesday. So far the move has been good for the company’s stock. Shares were up more than 7 percent in late morning trading. This entry was posted in Oil industry and tagged Deloy Miller, Miller Energy Resources, New York Stock Exchange, Scott Boruff on April 13, 2011 by Roger Harris. Rising oil prices during the first half of the year have been very good to Knoxville-based Tengasco Inc. The oil and gas exploration and production company reported late Friday it swung to a second quarter profit of $700,000, or 1 cent per share, up from a loss of $100,000 in the same period a year ago. This entry was posted in Oil industry and tagged oil and gas expliration, oil prices, production, Tengasco on August 13, 2010 by Roger Harris. Also, the well “expands the potential size of our Trego County Albers discovery field to the east, and adds significant additional reserves to the Company’s totals,” CEO Jeffrey Bailey said in a statement. The announcement was made at the annual shareholders meeting in Knoxville. Unlike global oil giant BP, Tennessee oil companies are off to a good start in the first half of 2010. In addition to Tengasco’s Kansas success, Huntsville, Tenn.-based Miller Petroleum has seen 200 percent year-over growth and recently acquired $300 million worth of assets in Alaska’s Cook Inlet. Miller expects its new Alaska assets to produce 1,100 barrels a day by the end of the year. Tennessee’s oil companies may be tiny players in the world market, but at least they aren’t responsible for the worst environmental disaster in the history of the universe. Things are so bad at BP, CEO Tony Hayward might even trade places with his Tennessee counterparts, even if it would mean a $4 million paycut and no more yacht racing. Then again, probably not. He wants his life back, after all. This entry was posted in Oil industry and tagged BP, Jeffrey Bailey, Kansas, Miller Petroleum, Tengasco, Tony Hayward on June 22, 2010 by Roger Harris. So far nothing has worked, but at least BP keeps trying to cap the gushing Gulf oil well. Give the company credit for trying. Not that it has any choice. But BP has a choice when it comes to PR and it is failing miserably. Miserably. BP can’t win the public relations battle — people are too mad and the damage too extensive — but the company should get imaginative in its approach to the public. It should start making significant payments to every Gulf Coast company hurt, or potentially hurt, by the spill. This entry was posted in Oil industry and tagged BP, Gulf Coast, oil spill, public relations on June 1, 2010 by Roger Harris. May has been a newsy month for Miller Energy Resources. The latest bit of good news was CEO Scott Boruff being named the 2009 Tennessee Oil Man of the Year by the Tennessee Oil and Gas Association. The award was presented last week at the association’s annual meeting in Knoxville. “This award really should have been designated for our entire company,” Boruff said in a statement released today. “The tremendous accomplishments in 2009 at Miller Energy Resources could not have been achieved without the hard work and dedication of the team we have assembled within our organization and I want to thank them all. May started with the Huntsville, Tenn., natural gas and oil production and exploration company going public and trading on the Nasdaq market. Tennessee isn’t exactly overrun with oil and gas companies, but it’s still nice to have plaques for the office wall. Read more on Miller’s IPO here. This entry was posted in Oil industry and tagged Miller Energy, Scott Boruff, Tennessee Oil and Gas Association on May 19, 2010 by Roger Harris.